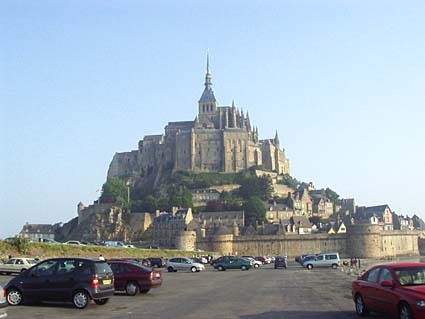 A few years ago on a road trip of Normandy we visited the UNESCO World Heritage Site of Mont Saint Michel. 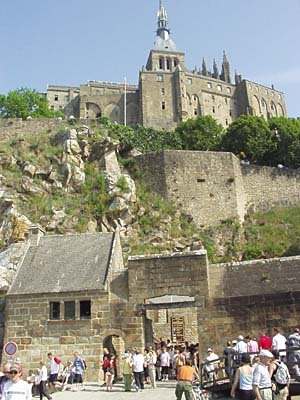 Mont Saint Michel is a small rocky islet in Normandy, roughly 1 km from the north coast of France. 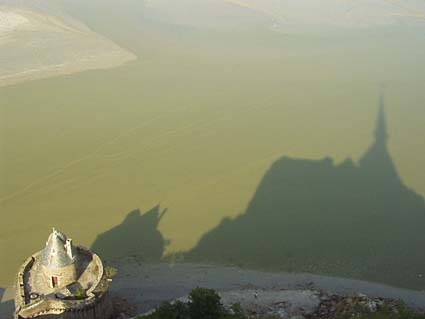 The mount used to be a true island at high tide, but a road now leads to the popular tourist destination. When we drove on this road back on 30 May 2003 there were large official-looking road signs pointing cars to park at a huge paid parking lot about a half kilometer from the entrance of the small town. I saw that in the distance there was a much closer parking lot, so I asked the parking attendent if we could park closer, but he insisted that we pay (I believe it was around 5 EURO at the time) and park there. After parking we walked toward Mont Saint Michel and noticed that the closer parking was actually free! I don’t know if they’re still doing this, but be aware if they are. 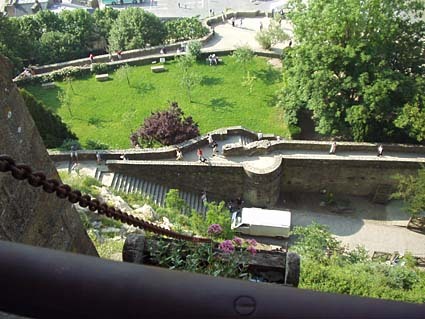 Once inside the gate we had a look around the winding streets, watched the famous omelets being made at Mere Poulard’s, and walked up to the fortifications around the Abbey to look out at the sea. We had a three-course menu at La Croix Blanche. On the first evening we visited, the town was very quiet and there were few people walking the streets, though some of the restaurants were crowded. If you get a chance to visit Mont Saint Michel on your own you should definitely come in the evening to avoid the hundreds of buses that flood the place in the morning. When we left the town it was still light out. We could see that the tide had receded and a few people were walking around the edge of the island. We walked about a quarter of the way around on the wet, slimy sludge. We saw a warning sign posted to beware of a friendly / aggressive seal named “Billy”. We didn’t spot Billy but we did see plenty of fish hopping around. 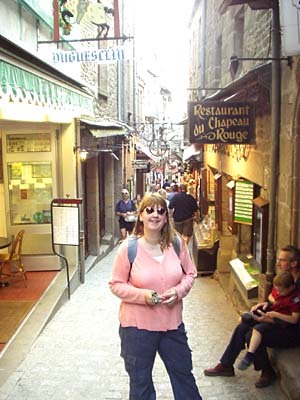 On the next day we visited Mont Saint Michel again in the early morning. There were sheep grazing everywhere we could see, on the green grassy fields of the coast around the island. We walked up to the Abbey and paid for entrance and audio guides. We walked through the self-guided tour. The visit was very nice and the audio guide provided a lot of interesting information and background. 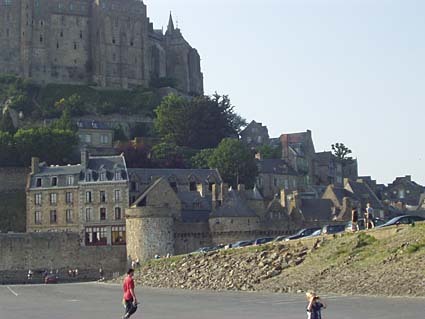 As we left Mont St. Michel we were amazed at the number of people in the tiny streets and, especially once we left the island, the number of pedestrians and cars crawling along the causeway towards the Mont. The narrow streets were like a crowded day in Disneyland. The parking lots looked to be completely full. This entry was posted on Monday, March 20th, 2006 at 9:44 am CET and is filed under Travel	with tags . You can follow any responses to this entry through the RSS 2.0 feed. You can leave a response, or trackback from your own site.